Would you like to help people become more confident, healthier, in control? Train to be a qualified hypnotherapist. Training is held in Ebbw Vale, South Wales and Penygroes, Caernarfon, North Wales. Both venues have easy parking and great local accommodation available. Training in Penygroes, Caernarfon, North Wales is in conjunction with David Davies of Gwyndd Hypnotherapy. Both courses and venues offer the same high standard of training and qualifications. Ebbw Vale – Full Hypnotherapy Diploma Course. Starts 7th September 2019 for 8 months. Intensive weekday training option also available. Register your interest Here now. Application: Once you have downloaded your prospectus, please book online, or request a booking form which will be sent by email. Practitioner Course Fees: £2150 which can be spread over 6 months. £200 deposit payable when returning the booking form, balance payable either before the start date or by arrangement over 6 months. Please pay by bank transfer: Details available on request. 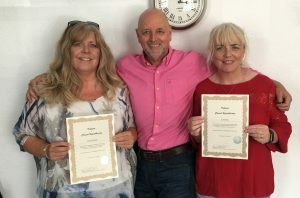 The training is in small friendly groups limited to a maximum of 6, this way you receive individual attention enabling you to become a skilled, confident and qualified Hypnotherapist. 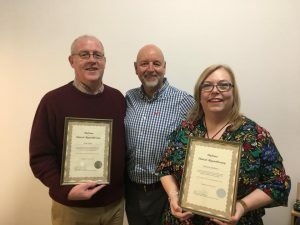 The Hypnotherapy Diploma Training Course offered by Hypnotherapy by David Finch has been assessed and accredited at Practitioner level by the General Hypnotherapy Standards Council (UK). 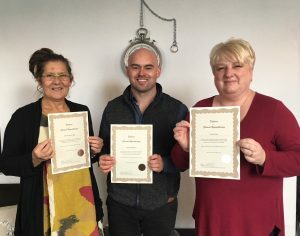 Graduates from this course are eligible for professional registration with the General Hypnotherapy Register (the GHSC’s Registering Agency) at full Practitioner status, together with the acquisition of the industry-based award – the General Qualification in Hypnotherapy Practice (GQHP). Students will be given ongoing help and advice to enable them to run a successful hypnotherapy business, or seek employment within a clinic. Once you have downloaded the prospectus, you may choose to book a meeting to answer any question you may have. During this time we can discuss the course in more detail. Confirming the qualifications, payment options, ongoing support and training. You will then be invited to visit our training facilities in Ebbw Vale or Penygroes. This is your opportunity to ask any questions you may have and find out more details of the hypnotherapy training course, with no obligation. Would you like the skills to create great audio recordings? Give them away or sell them on your website? Do you want to learn how to record and edit your own recordings to sell online? Maybe you would like to record your client sessions and provide them with their own recordings? I will show you how. During this one day intensive course. You will need to have a basic understanding of using a PC, creating folders within folders, able to save files and move files. The rest will be explained on the course. What type of microphones are best? How to edit out mistakes. Adding the files to your website. This is a hands on course – not just theory based. Please bring your own laptop (Windows or Mac) & headphones, everything else provided. Workbook to keep, this will re-enforce your learning. Location – The Retreat, 13 Market Street, Ebbw Vale, NP23 6HL. South Wales.